According to a recent survey, fewer than one in twenty residents in low-income elder-care facilities in northern Illinois, use broadband services despite the demonstrated appeal for staying in touch with distant family, accessing social and government services, and improving quality of life. 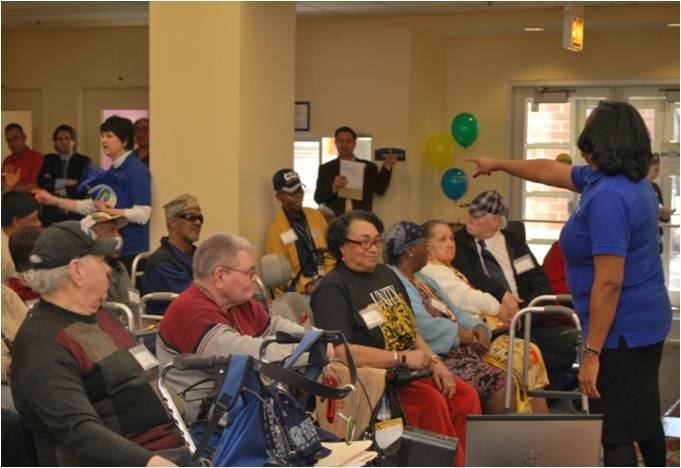 MyWay Village, in partnership with the Illinois Department of Commerce and Economic Opportunity and the Illinois Low Income Senior Internet Coalition, plans to transform its Connected Living Adoption and Sustainability Program, a longstanding program that ties technology, training, and technical support together in a way uniquely tailored for the senior community. Through both traditional and grassroots awareness efforts, the project plans to engage its 23 targeted senior housing communities to teach the basics of e-mail, Web access, and other practical broadband applications. The project also intends to collaborate with local Workforce Investment Act organizations to help seniors who develop their digital literacy skills to find part time work. MyWay Village opened computer learning centers in 16 senior citizen housing communities across Northern Illinois after receiving BTOP funds. These centers are supporting a statewide initiative to provide affordable Internet and computer skills training to low-income seniors. Besides access to computer labs, residents also receive free Internet service in their apartments and computer training classes. Residents can attend classes on a variety of topics including computer basics, Internet fundamentals, advanced Internet searching techniques, open office software, and webpage design. As an added incentive, individuals who complete 12 hours of training receive a free personal computer. BTOP funds have allowed the project to create 24 new jobs. Hired as Computer Program Managers, new staff members manage the computer labs and provide instruction for training classes. Additionally, the funds have provided residents with new computers, cameras, scanners, and printers. The impact of the project can be felt across multiple housing communities. A total of 690 building tenants have enrolled in training classes, with many more scheduled to register. The organization, which is in the process of changing its name to ConnectedLiving, Inc., has helped residents use digital technology to connect with family members and access health information online. The impact of the project is evident at The Grundy Housing Authority, where BTOP funds have drastically changed the lives of the community residents. To experience this impact up close, watch Grundy Housing Authority’s video. Amendment 2 Form CD-451, Special Award Conditions, Changed Name to Connected Living Inc.